WWW.WAFFEN-SS.NO "1.SS Leibstandarte-SS Adolf Hilter"
07/42: SS-Division "Leibstandarte-SS Adolf Hitler"
10/43: 1.SS-Panzer-Division "Leibstandarte-SS Adolf Hitler"
The Leibstandarte SS Adolf Hitler (German for "Adolf Hitler's Bodyguard Regiment") was a unit of the SS. It was a Waffen SS security and combat formation which saw action on both the Eastern and Western fronts during World War II. As its name suggested, the Leibstandarte started life in the early days of the NSDAP as Hitler's personal, élite bodyguard. As the Waffen SS increased in size throughout the 1930s and into the war years, so the Leibstandarte SS Adolf Hitler evolved into a full-sized panzer division, a detachment of which was always close to Hitler. It went from being "asphalt soldiers" to being one of the most famous military divisions of the war. In the earliest days of the NSDAP, it was realised by the leaders that bodyguard units composed of trustworthy and loyal men would be a wise development. Ernst Röhm formed a guard formation from the 19.Granatwerfer-Kompanie, and from this formation the Sturmabteilung (SA) soon evolved. Adolf Hitler, realising the potential threat that the SA had presented, in early 1923 ordered the formation of a bodyguard for himself. The tiny unit, originally formed by only eight men (and commanded by Julius Schreck and Joseph Berchtold), was designated the Stabswache (Staff Guard). 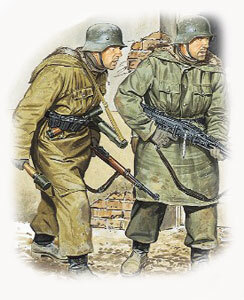 The guards of the Stabswache were issued uniforms that showed their difference from the SA (despite the fact that at this stage the Stabswache still was under overall SA control). Schreck resurrected the use of the Totenkopf (skull) as insignia, which had been a symbol used by various élite forces throughout the Prussian kingdom and the later German Empire. Julius Schreck and the men of the Stoßtrupp Adolf Hitler, 1923.Soon after its formation, the unit was renamed Stoßtrupp Adolf Hitler. On 9 November 1923, the Stoßtrupp, along with the SA and several other NSDAP paramilitary units, took part in the abortive Beer Hall Putsch in Munich. In the aftermath of the putsch, Hitler was imprisoned and the NSDAP and all associated formations, including the Stoßtrupp, were officially disbanded. Shortly after Hitler's release in 1924, he ordered a new bodyguard unit formed, again called the Stabswache, but this time it did not fall under SA control. In 1925, the Stabswache was renamed as the Schutzstaffel, abbreviated SS. 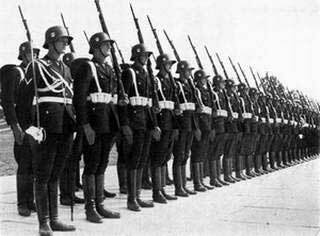 By March 1933, the SS had grown from a tiny personal bodyguard unit to a formation of over 50,000 men. 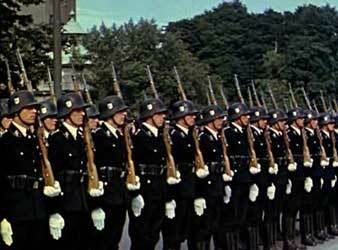 The decision was made to form a new bodyguard unit, picking the most capable and trustworthy SS men to form its cadre. On 17 March 1933, the SS-Stabswache Berlin was formed, under the command of Josef 'Sepp' Dietrich, Hitler's personal bodyguard. Dietrich hand-picked 120 men to form the SS-Stabswache. The unit was based at the Alexander Barracks in Berlin. Later in 1933, the formation was redesignated SS-Sonderkommando Zossen and a second unit of 120 men, designated SS-Sonderkommando Jüterbog was raised. The two Sonderkommandos provided guards for the NSDAP hierarchy, functioned as training cadres for the SS, and for a short time acted as auxiliary police units. In September 1933, the two Sonderkommandos were merged into the SS-Sonderkommando Berlin. In November 1933, on the 10th anniversary of the Beer Hall Putsch, the Sonderkommando took part in the rally and memorial service at the Feldherrnhalle, erected in the place where many NSDAP members had fallen during the putsch. All members of the Sonderkommando then swore personal allegiance to Hitler himself. 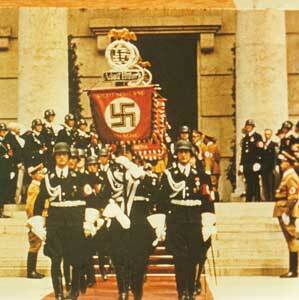 To conclude this ceremony, the Sonderkommando received a new title, Leibstandarte Adolf Hitler. In early 1934, Heinrich Himmler, the Reichsführer-SS, ordered the Leibstandarte to be renamed Leibstandarte SS Adolf Hitler (LSSAH). In late June, the LSSAH was called into action for the first time. Ernst Röhm, the Stabschef-SA, began to push for greater power for his already powerful SA. Hitler decided that the SA had to be put in its place, and ordered Himmler and Hermann Göring to prepare their élite units, Himmler's Leibstandarte and Göring's Landespolizeigruppe General Göring, for immediate action. The LSSAH formed two companies under the control of Jürgen Wagner and Otto Reich, and these formations were moved to Munich on 30 June. Hitler ordered all SA leaders to attend a meeting at the Hanselbauer Hotel in Bad Wiessee, near Munich. On 30 June, Hitler joined Sepp Dietrich and a unit from the Leibstandarte and travelled to Bad Wiessee to personally command Röhm's arrest and subsequent execution. In what the Nazis called the Röhm Putsch to give their action an appearance of legitimacy, but otherwise came to be known as the Night of the Long Knives, the execution companies of the LSSAH, together with Göring's Landespolizeigruppe, performed Death Squad actions, carrying out many executions without trials over the next few days. By 13 July 1934, at least 177 people had been executed. The actions of the LSSAH and Göring's unit had succeeded in effectively decapitating the SA and removing the threat to Hitler's leadership. Following the 'success' of the Night of the Long Knives, in recognition of their actions, both the LSSAH and the Landespolizeigruppe General Göring were expanded to regimental size and motorised. In addition, the SS was finally removed from overall SA control. 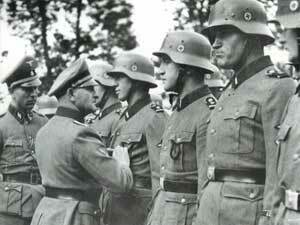 As the SS began to swell with new recruits, the LSSAH remained the pinnacle of Hitler's Aryan ideal. Strict recruitment regulations meant that only those deemed sufficiently Aryan, as well as being physically fit and fervent National Socialists, would be admitted. he LSSAH provided the honour guard at several of the Nuremberg Rallies and in 1935 took part in the reoccupation of the Saarland. The Leibstandarte was also in the vanguard of the March into Austria as part of the Anschluss. The LSSAH then took part in the occupation of the Sudetenland. In March 1939, it was involved in the annexation of Bohemia and Moravia. Soon after this action, the LSSAH had several motorised components attached, including an armoured car platoon and a motorcycle unit, and was redesignated Infanterie-Regiment Leibstandarte SS Adolf Hitler (mot.). In January 1939, the Leibstandarten-Ball was held at the Berlin Zoo. Sepp Dietrich had organised this high-profile gala for his men, with famous performers Hans Albers, Heinrich George, and Käthe von Nagy. The guest of honor was Heer commander-in-chief, Walther von Brauchitsch. When Hitler ordered the formation of an SS division in mid 1939, the Leibstandarte was designated to form its own unit, unlike the other Standarten of the SS-Verfügungstruppe (SS-VT), (SS-Standarte Deutschland, SS-Standarte Germania, and SS-Standarte Der Führer). The Polish crisis of October 1939 put these plans on hold, and the LSSAH was ordered to join XIII.Armeekorps, a part of Army Group South which was preparing for the attack on Poland. During the initial stages of the Invasion of Poland, the LSSAH was attached to the 17.Infanterie-Division and tasked with providing flank protection for the southern pincer. The regiment was involved in several ferocious battles against Polish cavalry brigades attempting to hit the flanks of the German advance. At Pabianice, a town near Łódź, the LSSAH fought off elements of the Polish 28th Infantry Division and the Wołyńska Cavalry Brigade in ferocious close combat. After the success at Pabianice, the LSSAH was shifted to the area near Warsaw and attached to the 4.Panzer-Division under Generaloberst Georg-Hans Reinhardt, where it saw action preventing encircled Polish units from escaping, and repelling several desperate attempts by other Polish troops to break through. The LSSAH had proved itself an effective fighting unit during the campaign, though several Heer Generals had reservations about the high casualties which the LSSAH and the SS-VT units had sustained in combat. The regiment was shifted to the Dutch border for the launch of Fall Gelb, and was to form the vanguard of the ground advance into the Netherlands, tasked with capturing a vital bridge over the Ijssel and linking up with the Fallschirmjäger of Generaloberst Kurt Student's airborne forces, the 7.Flieger-Division and the 22.Luftlande-Infanterie-Division. The Invasion of France and the Netherlands was launched on 10 May 1940. On that day, the LSSAH covered over 75 km, securing a crossing over the Ijssel near Zutphen after discovering that their target bridge had been destroyed. Over the next four days' fighting, the LSSAH covered over 215km, and earned itself dubious fame by accidentally shooting at and seriously wounding Generaloberst Student near Amsterdam. After the surrender of the Netherlands on 14 May, the regiment was used to form part of the reserve for Army Group B. After the British armoured counterattack at Arras, the LSSAH, along with the SS-Verfügungs-Division was moved to the front lines to hold the perimeter around Dunkirk and reduce the size of the pocket containing the encircled British Expeditionary Force and French forces. Near Wormhoudt, the LSSAH ignored Hitler's orders for the advance to halt and continued the attack, suppressing the British artillery positions on the Wattenberg Heights. During this battle the regiment suffered heavy casualties. After the attack, elements of LSSAH's II.Battalion, under the command of SS-Hauptsturmführer Wilhelm Mohnke, were mistakenly informed that their divisional commander Sepp Dietrich had been killed in the fighting. In what is known as the Wormhoudt Massacre, about 80 British POWs of 2nd Battalion of the Royal Warwickshire Regiment were executed in retaliation for the supposed death of Dietrich. Although it is unarguable that the massacre occurred, Mohnke's level of involvement is impossible to know, and as such he was never brought to trial to face the allegations. The tragic events at Wormhoudt showed that while the men of LSSAH formed an excellent fighting machine, they were also a politically indoctrinated unit. The regiment ended the campaign on the coast near Dunkirk. After the conclusion of the Western campaign, the LSSAH was expanded to brigade size. Despite this, it retained the designation regiment. A FlaK battalion and a StuG Abteilung were among the formations added to the LSSAH. During the later months of 1940, the regiment trained in amphibious assaults in preparation for Operation Seelöwe. After the failure of the Battle of Britain and the cancellation of the operation, the LSSAH was shifted to Bulgaria in preparation for Operation Marita, part of the planned invasion of Greece and the Balkans. The Operation was launched on April 6 1941. The LSSAH was to follow the route of the 9.Panzer-Division, part of General der Panzertruppen Georg Stumme's XL.Panzer-Korps. The regiment crossed the border near Prilep and was soon deep in Greek territory. The LSSAH captured Vevi on April 10. Sturmbannführer Kurt Meyer's reinforced Aufklärungs-Abt 1 LSSAH was tasked with clearing resistance from the Klissura Pass, south-west of Vevi and driving through to the Kastoria area to cut off retreating Greek and British Commonwealth forces. Resistance from the Greek 20th Division was fierce. According to some accounts, the SS were inspired to capture the Klissura Pass only after Meyer threw a grenade at the feet of some of his soldiers. Sturmbannführer Fritz Witt's I.Battalion was tasked with clearing the Klidi Pass, just south of Vevi and strongly defended by Australian, British and New Zealand troops. Witt's Battalion was reinforced and renamed Kampfgruppe Witt. An Australian officer wrote of the Germans' "insolence" in driving "...trucks down the main road — to within 3000 yards of our infantry", and there unloading the SS troops. The Germans were forced off the road and faced fierce resistance for more than two days. On the morning of April 12, the Germans launched a frontal assault, and by late afternoon the pass was cleared. I.Battalion LSSAH had inflicted many casualties and captured over 520 prisoners for the loss of only 37 dead and 95 wounded. With the fall of the two passes, the main line of resistance of the Greek First Army was broken, and the campaign became a battle to prevent the escape of the enemy. On April 20, following a pitched battle in the 5,000-foot-high Metsovon Pass in the Pindus Mountains, the commander of the Greek First Army surrendered the entire Hellenic Army to Dietrich. British Commonwealth troops were now the only Allied forces remaining in Greece, and they were falling back across the Corinth Canal to the Peloponnesos. By April 26, the LSSAH had reached the Gulf of Patras, and in an effort to cut off the retreating British Commonwealth forces, Dietrich ordered that his regiment cross the Gulf and secure the town of Patras in the Peloponnesos. Since no transport vessels were available, the LSSAH commandeered fishing boats and successfully completed the crossing, despite being forced to leave much of their heavy equipment behind. By April 30, the last British Commonwealth troops had either been captured or escaped. The LSSAH occupied a position of honour in the victory parade through Athens. Following Operation Marita, the LSSAH was ordered north, to join the forces of Army Group South massing for the launch of Operation Barbarossa. Following the LSSAH's outstanding performance during Marita, Himmler ordered that it should be upgraded to divisional status. As such, the Regiment, already the size of a reinforced brigade, was redesignated SS-Division (mot.) Leibstandarte SS Adolf Hitler. Despite this, there was no time to refit the division to full divisional status before the launch of Operation Barbarossa, the invasion of the Soviet Union, and so the new 'Division' remained the size of a reinforced brigade. The LSSAH was attached to the LIV.Armee-Korps and held in reserve during the opening stages of the attack. In August, it was transferred to III.Panzer-Korps, part of Generalfeldmarschall Ewald von Kleist's Panzergruppe 1. During this time, the LSSAH was involved in the Battle of Uman and the subsequent capture of Kiev. During this time, the division was involved in heavy fighting, with Meyer's Abteilung particularly distinguishing itself. In early September, the division was transferred back to LIV.Armee-Korps, preparing to launch an offensive to clear the Crimean peninsula. The operation was launched on 17 September 1941. The LSSAH was involved in heavy fighting for the town of Perekop, before advancing across the Perekop Isthmus to assault the Soviet defensive positions near the Tarter Ditch. In November, the LSSAH was transferred back to Panzergruppe 1 and took part in the heavy fighting for the city of Rostov-on-Don, which was captured in late November. During Operation Barbarossa, the division had penetrated 960 kilometers into Soviet territory. Heavy Soviet counterattacks during the winter meant that Army Group South had to fall back from Rostov-on-Don to defensive lines on the river Mius. The LSSAH spent the winter fighting ferocious defensive battles in temperatures of down to -40°C, with minimal winter clothing and only 150 grams of rations per man per day. Despite this, the division held. After the spring rasputitsa had cleared, the exhausted division joined in Fall Blau, partaking in the fighting to retake Rostov-on-Don, which was recaptured in late July, 1942. Severely understrength and completely exhausted, the LSSAH was pulled out of the line. The division was ordered to the Normandy region of occupied France to join the newly formed SS-Panzer-Korps and to be reformed as a panzergrenadier division. The LSSAH spent the remainder of 1942 refitting as a panzergrenadier division. Thanks to the efforts of the Reichsführer-SS, along with SS-Obergruppenführer Paul Hausser, the SS-Panzerkorps commander, the four SS panzergrenadier divisions (LSSAH, Wiking, Das Reich and Totenkopf were to be formed with a full regiment of tanks rather than only an Abteilung. This meant that the SS Panzergrenadier divisions were full-strength Panzer divisions in all but name. Also, the division received nine Tiger 1 tanks, and these were formed into 13. (schwere)Kompanie/SS-Panzer-Regiment 1. The collapse of the front around Stalingrad and the encirclement of the 6.Armee meant that the entire eastern front was close to collapse. Generalfeldmarschall Erich von Manstein, commander of Army Group Don, requested reinforcements to halt the Soviet attack near Kharkov. The SS-Panzerkorps was ordered east to join Manstein's forces. Arriving at the front in late January 1943, the LSSAH was thrown into the line defending Kharkov itself as a part of Hausser's SS-Panzer-Korps. Facing them were the hundreds of T-34s of Mobile Group Popov, a Soviet armoured Army sized formation which formed the spearhead of the Soviet advance. On 8-9 February, 1943, the LSSAH's SS-Panzergrenadier-Regiment 1 under SS-Sturmbannführer Fritz Witt, fighting alongside SS-Sturmbannführer Max Wünsche's I./SS-Panzer-Regiment 1, fought a bitter delaying action near the town of Merefa, halting a major Soviet attack. The division fought in many desperate defensive battles over the next few weeks, gradually being pushed back into the city of Kharkov itself. Despite inflicting heavy losses on the Soviets, and rebuffing all enemy attacks, the Soviets succeeded in outflanking the corps. On 15 February, Hausser ignored Hitler's orders to hold the city at all costs and ordered the SS-Panzer-Korps to abandon the city and withdraw towards Krasnograd. Over the next week, the SS-Panzer-Korps annihilated Mobile Group Popov in a series of brilliant and hard fought battles. The LSSAH was a major participant in these battles, destroying several Soviet divisions and inflicting heavy losses. Hausser now ordered that Kharkov should be recaptured. 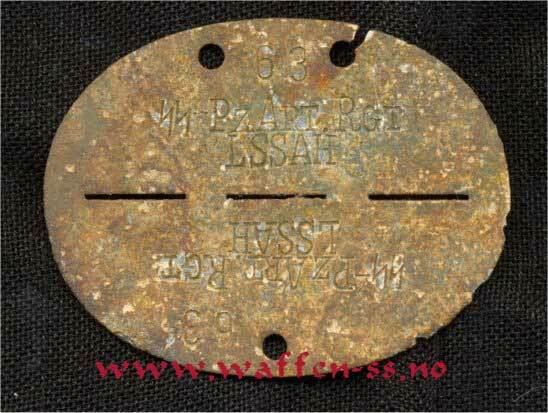 The LSSAH, Das Reich and Totenkopf were to form the spearhead of the attack. The attack got underway on 2 March. The LSSAH was formed into three Kampfgruppen which would attack towards and capture Kharkov. Over the next weeks, the LSSAH would take part in the ferocious battles to take the city. Kampfgruppe Meyer, under Panzermeyer's command, penetrated to Red Square before being cut off. Kampfgruppe Witt saw heavy fighting against a Soviet blocking force near Dergatschi before it also broke through into the city. Both Kampfgruppen were repeatedly cut off during the confused fighting, and it was not until Kampfgruppe Peiper, under Joachim Peiper, broke through that the defenders were finally overwhelmed. By 21 March, the battle was over and Kharkov was back in German hands, with Peiper's Kampfgruppe having penetrated as far as Belgorod. In honour of the 4,500 casualties suffered by the Leibstandarte in the fighting, Kharkov's Red Square was renamed Platz der Leibstandarte SS Adolf Hitler. The division was pulled back for much needed rest and refit. The spring rasputitsa halted offensive operations, giving the Leibstandarte time to rest and refit. By early June 1943, the division had been fully refitted. Its armour strength was 12 Tiger Is, 72 Panzer IVs, 16 Panzer III and Panzer IIs, and 31 StuGs. In late June 1943, the formation of I.SS-Panzerkorps meant that Hausser's SS-Panzerkorps was renamed II.SS-Panzerkorps. The II.SS-Panzerkorps was moved north to Belgorod in preparation for the upcoming Summer offensive, Operation Citadel. The LSSAH, along with the Totenkopf and Das Reich, was to form the spearhead of Generaloberst Hoth's 4.Panzer-Armee, tasked with breaching the southern flank of the Kursk salient. Generalfeldmarschall Walter Model's 9.Armee was to breach the northern flank, and the two forces were to meet near the city of Kursk, thereby encircling a large Soviet force. The II.SS-Panzerkorps reached its assembly areas on 28 June and began preparing for the assault. The attack was set for 5 July, and on 4 July the II.SS-Panzerkorps, as well as the XLVIII.Panzerkorps on its left and the III.Panzerkorps on the right, began minor attacks to secure observation posts. Fighting lasted throughout the day, with the LSSAH Pionier-Bataillon seeing heavy action clearing out the entrenched Soviets. The Soviet run Lucy Spy Ring had infiltrated the German OKW and informed STAVKA of the impending operation. Captured German troops provided details of the objectives and locations of the major assaults. Before dawn on July 5, 1943, the Soviet artillery launched a massive bombardment against the German assembly areas. Despite this, the attack got underway after only a brief delay, and under perhaps the largest air battle in history, as the German aircraft defended against a Soviet VVS's attempt to annihilate the Luftwaffe on the ground. The LSSAH panzers, advancing in Panzerkeils, soon ran into the Soviet Pakfronts. The elaborate system of Soviet defences slowed the attack, but unlike in Model's sector, the 4.Panzer-Armee, spearheaded by the SS-Panzerkorps and the LSSAH, was not halted, and eventually broke through. By 9 July, the SS-Panzerkorps had advanced 30 miles north, and were nearing the small town of Prokhorovka. The Leibstandarte again took the lead, by now its armour strength reduced to just 77 armoured vehicles. SS-Panzergrenadier-Regiment 2, supported by several panzers, advanced straight up the road to Prokhorovka against heavy resistance. By midday, the grenadiers had cleared the Komsomolets State Farm and the began the attack on Hill 241.6, which they secured shortly after nightfall on 10 July. On 11 July, the advance resumed. With the division capturing Oktiabr'skii State Farm and Hill 252.2 in heavy fighting against Soviet Paratroops of the 9th Guards Airborne Division. On 12 July, the Soviets threw the 5th Guards Tank Army into a counterattack near Prokhorovka. Two tank corps faced the Leibstandarte hitting the advancing Germans around Oktiabr'skii State Farm and Hill 252.2. In the ensuing fighting, the outnumbered Germans inflicted heavy casualties on the Soviets, knocking out many tanks. In the process, the Leibstandarte also suffered relatively light casualties, however the Soviet counterattack had stalled the German advance, and the division was forced to fall back to Oktiabr'skii. Fighting continued on the 13th, but the focus of the Soviet attack had shifted to the Totenkopf, to the left of the Leibstandarte. With the Battle of Prokhorovka still in the balance, a massive Soviet counteroffensive near Orel, caused Hitler to order the cancellation of Citadel. The SS-Panzerkorps was pulled back. LSSAH was ordered out of the line. It was to be sent to Italy to help stabilise the situation caused by the deposal of Mussolini by the Badoglio Government and the Allied Landings in Sicily on 10 July. The division left its armour and equipment, which was given to Das Reich and Totenkopf, and entrained for the trip to Italy. The division travelled back from the front, stopping at Innsbruck in Austria, where it disembarked. The division was re-equipped with vehicles and continued the journey by road, travelling across the alps and into Northern Italy. The division arrived on the Po River Plain on 8 August 1943. The Leibstandarte was given the task of guarding several vital road and rail junctions in the area of Trient-Verona. After several weeks operating in this area, the division was moved to the Parma-Reggio area. 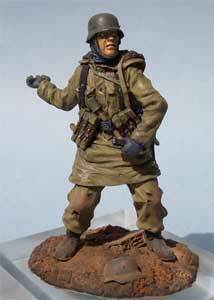 During this period, the Leibstandarte was involved in several skirmishes with partisans. With the Italian collapse of 8 September 1943, the division was ordered to begin disarming nearby Italian units. This went smoothly, with the exception of a brief skirmish with Italian troops stationed in Parma on 9 September. By 19 September, all Italian forces in the Po River Plain had been disarmed, but OKW was concerned by reports that elements of the Italian Fourteenth Army were regrouping in Piedmont, near the French border. Sturmbannführer Peiper's mechanised III./SS-Panzergrenadier-Regiment 2 was sent to disarm these units. Upon arriving in the Province of Cuneo, Peiper was met by an Italian officer who warned that his forces would attack unless Peiper's unit vacated the province immediately. Peiper refused, which goaded the Italians into attacking. The veterans of Peiper's battalion defeated the Italians in a fierce battle, and then proceeded to disarm the remaining Italian forces in the area. Following the disintergration and capitulation of Italy, the activities of partisan groups increased all across the area. The Leibstandarte was sent to the Istria Peninsula and was engaged in several major anti-partisan operations. During its period in Italy, the Leibstandarte was reformed as a full panzer division, and redesignated 1.SS-Panzer-Division Leibstandarte SS Adolf Hitler. In early November, the deteriorating situation in the east meant that the division was ordered back to the Russian Front, arriving in the Shitomir area in Mid November. The division was posted to XLVIII.Panzer-Korps, a part of 4.Panzer-Armee, which was struggling to hold the line near Shitomir. The division was broken up into several Kampfgruppen and thrown into action. On 18 November, Kampfgruppe Frey halted the advance of the Fifth Guards Tank Army near the town of Kotscherovo. Over the next two months, the division's Kampfgruppen saw very heavy fighting in the Shitomir area, performing fire-brigade actions and enabling XLVIII.Panzer-Korps to hold the line. In January 1944, one of the Leibstandarte's s.SS-Panzer-Abt 101 Tiger commanders, Michael Wittman, was awarded the Oakleaves to the Knight's Cross for his actions in halting the attack of an entire Soviet armoured brigade. The division was transferred to the Cherkassy area at the end of January, where it was assigned to III.Panzer-Korps, a part of 1.Panzer-Armee. When the 56,000 men of Gruppe Stemmermann were trapped in the Korsun Pocket in February 1944, the Leibstandarte, along with the remainder of III.Panzer-Korps and XLVII.Panzer-Korps were ordered to attempt to break the Soviet cordon and rescue the trapped forces. Hitler intervened, and ordered the relief attempt be transformed into an impossible attempt to counter-encircle two Soviet fronts. The Leibstandarte, along with Oberstleutnant Dr. Franz Bäke's 503rd schwere Panzer Abteilung spearheaded the attack. Despite initial gains, the attack soon stalled due to a combination of the resistance of four Soviet tank corps and the thick mud of the rasputitsa. The exhausted Leibstandarte managed to reach the Gniloy Tikich river, where a small bridgehead was established. The survivors of the encirclement fought their way through to the bridgehead and by late February the battle was over. he majority of the Leibstandarte was withdrawn to Belgium for rest and refit, however a Kampfgruppe was left behind. On 22 March, the entire 1.Panzer-Armee was encircled in the Kamenets-Podolsky Pocket. The Leibstandarte Kampfgruppe took part in the desperate fighting to escape the encirclement, forming a part of the spearhead which linked up with the II.SS-Panzer-Korps near Buczacz on 6 April, 1944. The shattered remnant of the Kampfgruppe was ordered to Belgium where it was to rest, refit and rejoin the remainder of the division. The LAH's most crucial role in Normandy would be the part it played against operation Goodwood. Launched 18 July, three strong British armoured divisions, with infantry support on their flanks, were to swing through the gap between Caen and the eastern heights. There they would have to get across the hills at Bourgιbus and break through towards open ground. The operation was preceded by a three hour of bombing assault by 2,500 aircraft, which knocked the German infantry senseless, rendered their Maschinegewehre42 useless by the vibrations, and knocked out most of the Panzer on the ground. Immediately afterwards the British tanks came rumbling on and seized all their primary objectives. 2.Kp./SS-Panzerregiment 1, located by the woods near Garcelles, received orders to attack the British at Soliers. SS-Obersturmfόhrer Malkomes drove in the direction of Bourguιbus with his 13 Panthers and discovered 60 enemy tanks S-SE of the town. He attacked them, destroying 20, and took Soliers. Around 12:00 hours the entire Panther-Batallion, I./SS-Panzerregiment 1, 46 Panther, was engaged in combat with the 29th Tank Brigade of the 11th Armoured Division. The body of Leibstandarte was rushed to the front from Falaise, where it was in reserve. It immediately counterattacked around 17:00, together with 21. Panzerdivision, which halted the British offensive on the left front. The British withdrew to Caen, leaving behind 126 destroyed tanks. At first, 19 July seemed to bring a discontinuation of Goodwood, as only some individual tanks assaults were carried out. But by 13:00 the Brits charged again, having brought up reinforcements to continue the attack. They quickly overran the forward German units and pressed on hard, a wave of tanks spearheading the attack. But when the leading Sherman/Fireflies and Cromwells approached the hill at Bourguιbus at 1600 hours, squad after squad was taken under fire and blown up. What happend? The Panthers of the Leibstandarte had taken up positions on the hill itself. Around 15:00 hours the first 12. SS-Pz.Div. HJ's elements arrived, which relieved the right front. The Brits failed to break out of their bridgehead, but Caen was now fully in their hands and their bridgehead had been expanded for 9 km. They had suffered the loss of 493 tanks, and 4,011 casualties. Despite this victory, in the face of complete Allied numerical superiority, 5 days later the Americans saw the chance to break out of their beachhead. The weakened German defense could not keep up with the savage battle of attrition as little or no reinforcements had arrived, supplies were shot up, and movement by day was made impossible. They stormed into the open, one column headed towards Avranches, and another column making an encircling movement towards St. Lτ. Hitler, never allowing a retreat, remained true to his creed and, instead, ordered an assault to be made. Leibstandarte, together with 4 other SS-Panzerdivisionen and 3 Wehrmacht Panzerdivisionen went on the attack on 7 August after moving to the assembly areas on 5 and 6 August. SS-Panzerregiment 1 along with two Panzergrenadier-Battalione, one Pionierkompanie and the FlaK-Abt. were used. The weather wasn't suited for flying that day, so the attack went smoothly at first, despite the fact that the Allies knew the attack was coming. Das Reich managed to recapture Mortain, and a gepanzerte Kampguppe under Jochen Peiper managed to go as far Bourlopin, but was stopped by massive swarms of Allied aircraft. Another attempt was mounted the next day, but failed. "It is true that one fighter bomber we shot down landed on a Panzer and destroyed it. Most other Panzer and Schόtzenpanzer, however, fell victim to this intensive air bombardment, which lasted hours. Those Grenadiere still able to fight had spread themselves out to the left and right through the terrain's many hedges. They were happy to see that the bombers swarming like bees over our heads were finding more rewarding targets than individual men. I agreed with them. I heard that Peiper had suffered a heart attack. Diefenthal (the commander of the III./2) lost his hearing when a bomb fell right next to him. Kuhlmann was unable to get the attack moving forward again. My brave messenger, Sturmmann Horst Reinicken, was killed as he tried to reach the command post of the Heer Panzerabteilung to which we were subordinated. He was trying to bring the Panzerabteilung the news that its commander and Adjutant lay dead not far from our hedge." After that it was over with the campaign in Normandy; Leibstandarte got encircled by the Americans and Brits in what would be called the Falaise pocket, but by then the unit was reduced to several small Kampfgruppen. Hausser, commander of 7. Armee was told by von Kluge (commander in chief West, as successor to von Rundstedt) to withdraw II. SS-Panzerkorps (Hohenstauffen and Frundsberg), his motors and his administrative personnel from the pocket. The Fόhrer had still not give orders to withdraw at this point, so it all depended on the will of the units themselves to get out. Leibstandarte withdrew from the pocket with Unterfόhrers and Fόhrers each taking the lead of a small Kampfgruppe and smashing through the ring, on 22 August, after which no combat read ready tanks or artillery pieces were reported. The whole campaign caused some 5.000 casualties to the LSSAH.